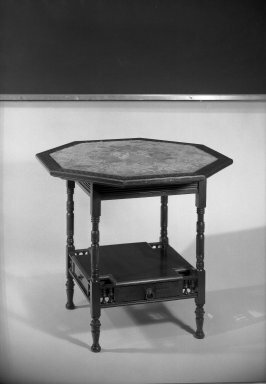 Table, mahogany with inlay of various woods, green velvet with silk and metal threads, brass. Octagonal tabletop with upholstered inserted panel of figured jacquard green velvet. Tabletop surrounded by inlaid stylized floral border resting on square apron with reeded decoration and four turned posts connected by sold stretcher with brass molding on top and cut-out corners with two short baluster-shaped spindles on each side of single two-sided drawer with brass bail pulls on each end and inlaid stylized floral decoration. Two false drawer fronts with brass pulls on remaining two sides. Turned legs with bun feet.